Awake: to be canceled or renewed? Awake: Will It Be Cancelled or Renewed for Season Two? This season alone, two of NBC’s most anticipated new Thursday night TV series — Prime Suspect and The Firm — have flopped. Is Awake different? Will it be cancelled or survive to see a second season? 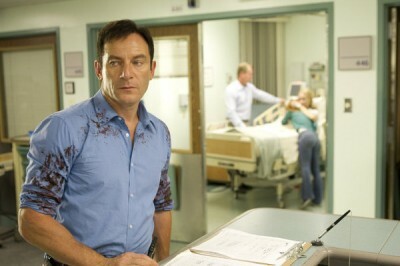 Awake revolves around police detective Michael Britten (Jason Isaacs) following a horrific car accident with his wife (Laura Allen) and son (Dylan Minnette). Britten discovers that he’s living two parallel realities. In one, his wife died in the accident. In the other, his son did. As he tries to discover what’s going on, he finds that details from both realities seem to bleed into the other. The cast also includes B.D. Wong, Cherry Jones, Michaela McManus, Steve Harris, and Wilmer Valderrama. The show debuted on March 1st with lots of positive reviews, a mediocre 2.0 rating in the all-important 18-49 demographic, and 6.24 million total viewers. It was first in its timeslot, opposite repeats on ABC and CBS. While the premiere of Awake didn’t generate great numbers, it did better than Prime Suspect and The Firm. It was also the best performance that NBC’s had in that timeslot since last May. Many contended that the premiere’s ratings were undercut because NBC released the pilot online well in advance — a strategy that seemed to help generate some buzz. If that gamble paid off, theoretically the numbers for the second episode would be better than the first. They weren’t. The ratings for episode two fell 20%, to a 1.6 demo rating and 4.33 million. It was easily beaten by an original edition of The Mentalist on CBS but topped a rerun of the GCB pilot on ABC. Week three of Awake held steady. If the show could maintain those numbers for the rest of the season, it would be safe. Unfortunately, it couldn’t. Episode four’s numbers dropped a whopping 25%. Weeks five and six then dropped another 17% and 10% respectively. After just a half dozen episodes, Awake is basically matching the Thursday night ratings of NBC’s other cancelled dramas. Based on the ratings, Awake is sure to be cancelled by May. They’re just too low for the peacock network to be able to justify a second season on the network. Given the state of NBC’s current schedule, it seems likely that the network will let the remaining seven episodes air on Thursday nights. If the ratings continue to drop, they may pull it or ship it off to the Saturday night graveyard with The Firm. Most importantly, it looks unlikely that viewers will have their questions answered by the last episode of Awake. But, what do you think? Are you still watching Awake? Have you lost interest? Do you think it should be cancelled or renewed for a second season? Awake: Is the New NBC Series Worth Watching? Love this show. It’s the only new show I really enjoy. I look forward to watching this show. I hope that they reconsider cancelling it. The premise reminds me of the movie “Momento”. The acting is first rate, and the plots are more interesting than most dramas of this type. I couldn’t agree more with practically everything you stated, and I was also a huge “Boomtown” fan. I honestly think they could fire all the “brilliant execs” at NBC, and hire people off the street with half-way decent common sense, and get better results with respect to ratings. I think Awake is the best new show this year. The concept is terrific, and it is very well done. I enjoy shows that require some thought, which is probably why there is nothing but reality shows on tv anymore. Big disappointment if it is cancelled. Best show on TV! don’t cancel! It will be a shame if it gets canceled. Do they count us peeps that watch it online? I’m usually too busy to watch it during its time slot. The only thing I think they can clean up a little, and they seem to be by adding the visual queues, is the transitioning back and forth. My son noticed the differences between the scene colorings but I didn’t. It definitely keeps you on your toes. I love the show! Don’t cancel it. OMG. Such a beautifully done and intriguing show. Have been the best drama/action series this year. Fantastic show!! Give it a chance! Look to your marketing team; their dropping the ball, not the show! Hype it up a little more! This show can make it! Great concept!! !